Do you struggle with sluggish conversion rate growth? Significant customer churn? Diminishing engagement across your existing customer base? Context-driven marketing is the solution. You can no longer send messages that depend on how your customers behaved last week, or even yesterday. Now you need real-time data including when your message is received; where your customer is when your message is received and what else might be influencing your customer the same time. 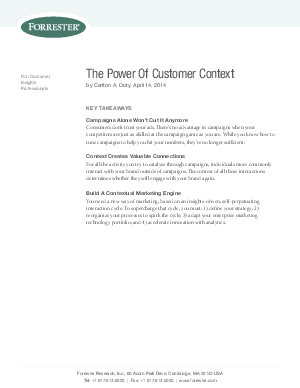 Find out why you need to build a contextual marketing engine today.